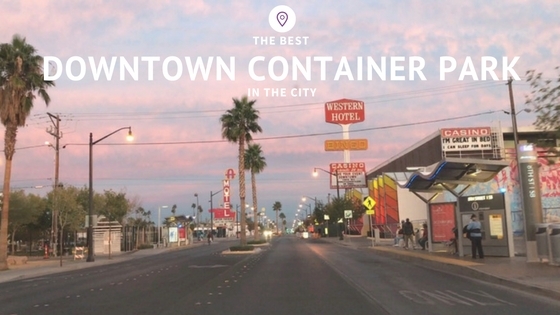 What the HECK is the Container Park? When I heard this place was opening downtown I didn’t really get it. Whenever something new happens to Vegas it’s BIG news! Everyone talks about it. Everyone wants to be the first to try it and it’s an exciting time… I’ve visited now (multiple times) and I get it. This place is so much fun. Before you go, I just want to say one thing…with anything we do in life, it is all about how we perceive it. If we go in with a good attitude, we have a fun time. Bad attitude and skeptical = not such a good time. Capice? 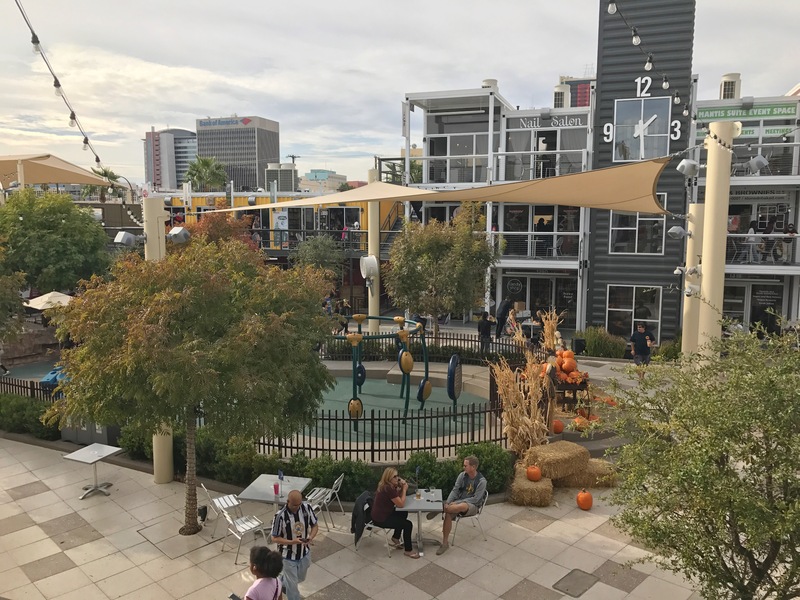 Back to my question – What is the Container Park? Short answer…it’s an outdoor shopping mall (kinda). 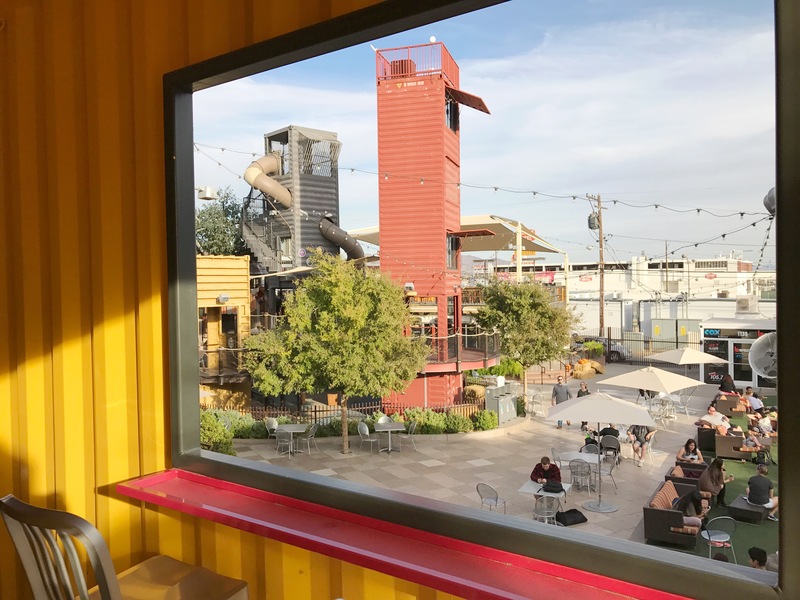 Long answer… The Downtown Container Park is a family-friendly outdoor shopping, dining and entertainment attraction made completely out of shipping containers. Super cool. In the center there is a kids play area (for adults as well) with a 30-foot slide and water area. Towards the back is an outdoor amphitheater for various musical groups, plays and movies. This place has it all. It’s a really unique venue that has virtually everything for everyone. Let me say I am NOT ashamed to say that I have been down the slide multiple times and love it. Before you go “poo-pooing” it, just climb to the top and tell me you don’t feel like a kid again waiting in line for a roller coaster. 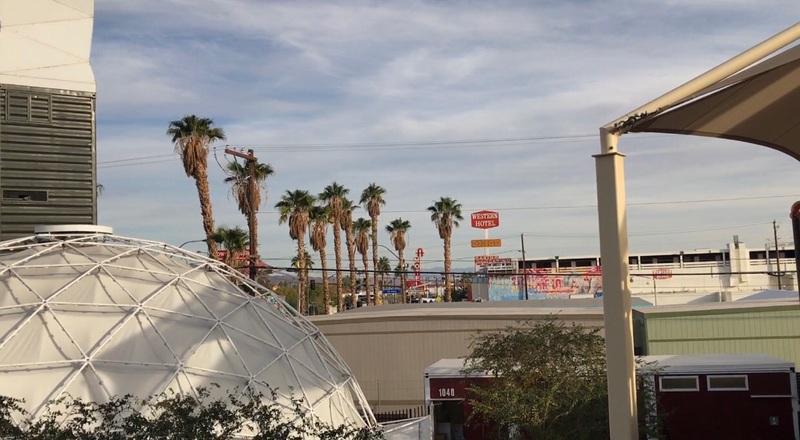 The Container Park is downtown and a short walk from Freemont street, so the surrounding area is a little sketch. I definitely would not be walking around alone. 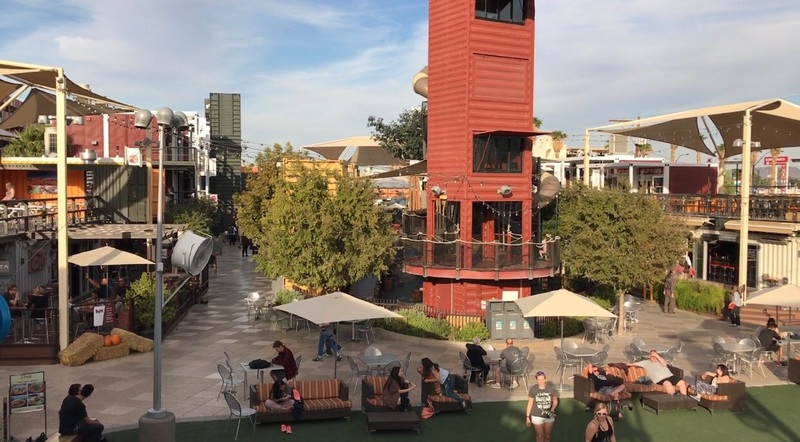 If you find yourself meeting some friends here and have a small walk from your car to the Container Park, there is ample security outside the park and nearby. But maybe watch some Kung Fu Panda to get some moves under your belt just in case. That panda’s got some moves! Don’t worry about missing this place. 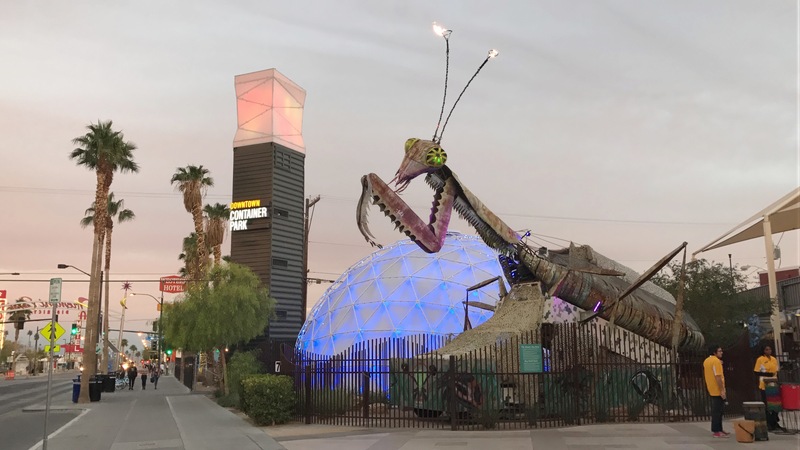 There is a giant, fire spewing praying mantis outside waiting to great you. Pro tip: Wait around to see people’s reaction when this thing goes off. Ha! Gets me every time. 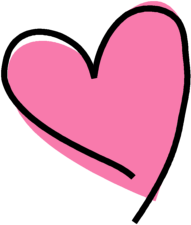 Feel free to come hungry and eat at one of the local restaurants (I recommend The Perch), or bring a picnic and sit on the grassy area near the amphitheater. Enjoy the shops, playground, people and of course, the shipping containers that make up this entire place. If you have kids, come anytime before 9 p.m. and if you are over 21, be ready to show your ID at the door. This place is well worth a visit. Can’t wait to hear what you think.